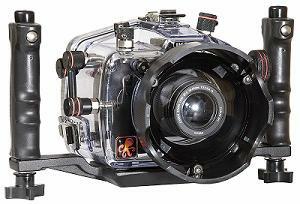 Why buy an Underwater Camera? If a picture says a thousand words, than taking a picture underwater of a thousand fish, must equal one million words? Right? Many times new divers forget about underwater video pictures when contemplating an underwater camera purchase, but if you think about the purpose of underwater photography, it is to share our experience underwater with others. Nothing says “what a scuba vacation ” more than a simple 10 minute clip of a reef and watching the fish sway to some recorded music. Film cameras have pretty much been relegated to the back shelf of technology. But if you are on a budget, a simple point and click camera will get the job done at a reasonable price. Make sure that you verify the maximum depth rating of the camera, before you make the dive. These types of camera come in a reusable and non-reusable choice of cases. The underwater digital camera is where my money is spent. Speaking of money, unless you are wealthy or do not plan to buy a house in the next year, STAY AWAY! Underwater photography is addicting. I spent more money on my camera equipment, than on my wife, but this is another topic for a different website (marriage counseling). Underwater digital cameras can be further defined into two categories: Simple point and shoot cameras with an underwater case or the digital SLR underwater camera. Some of the underwater strobe terms can be confusing, we have a quick guide to these terms at our underwater strobe terms guide. Even with the right underwater camera, perfect pictures are still a far off dream without the proper composition. As we add our composition pages, read through them to master this subject. I have always preferred to master one style of pictures, before moving on. Macro Photography or Close-up wide angle work has been the most enjoyable for me.